Sri. Bhawani Bhagawatimata Temple At Jaipur, India. Sri. Bhavani Bagwati Mata Temple is located in empty area of plot at survey no. C19, Bani Park, Jaipur with opening towards west side, Plot is facing road at two sides, Sawai Jaisingh Highway from south side and (Bihar) Tulsi Marg from west side. One existing structure is all ready placed at centre of the plot with open plot at north side of size 135� X 85� for the new temple. Keeping 20� open space from all sides, we are getting 95� X 45� rectangular plot from the new temple construction. 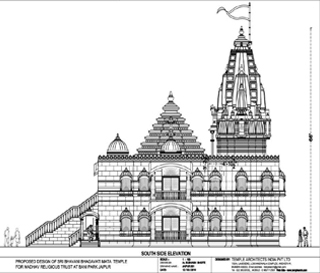 A Sat sang Hall is placed on ground floor and Temple is planned on first floor. 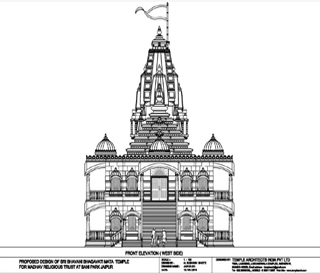 Temple is planned west facing so that we will face east while praying the statue. Basic concept is auspicious number 9 for Nav Mata and Nav Graha. All the dimensions derived from No.9 with multiplication of 9 inches. No. 9 is most auspicious in all nos. and is lucky for many peoples. Temple Building is with two floors structure. Main grids, horizontal and vertical are of 6�-9� (81�) with multiplication of No. 9. Entrance canopies of 81” X 81” size are at two sides of stair case. Entrance lobby to Satsang Hall of 13’-6” X 13’-6” below stair case. Right side of Entrance is a lift to go up on first floor for old and disable peoples. devotes coming for Satsang hall. The room will be controlling room for ground floor. with area of 1200 sft which is sufficient for 125 to 150 devotees seating. balcony of size 13’-6” X 6’-9” to accommodate 40 – 50 more devotes in future. At right side is a lift for coming from ground floor. system is provided in first floor temple and ground floor Satsang hall with separate control. face of sun god with his rays, Frosted glass is fixed in the window. A small Shree Ganeshji statue is at left side and Lord Shiva statue at right side on the platform with small shivliga in front of Lord Shiva Statue is placed along with Mata ji statue. So our prayer will start from Shree Ganeshji, then Mataji and last with Shivji. So we get proper and maximum blessing by praying this way. Pink and Red colored sand stone cladding is designed from all exterior sides and all domes / shikhars. Design of exterior art work is sangam (combination) of all types of Indian Temple architecture. Main Shikhar as North-West type, Sabha Mandap pyramid is of North-East type, Entrance half round domes, rounded projected chajjas, window jalis & chajjas, (Zaroka) as Jaipur style of architecture and some of relief work details / motifs are south Indian architecture style. All these details are blended / combined together to show complete Hindu (Indian) Temple architecture beautifully. Interior of Sabha Mandap and Satsang hall is artistically designed, carved and done in white marble. All walls have many spiritual statues relief works and religious motifs. False ceiling will be done artistically in plaster of Paris material. Electrical light fittings and music system will also have important role in this temple Vastu. Maximum height of Temple Shikhar with Kalash will be 792” (66 feet ) total of which is No. 9. Many other details are designed to get positive waves and inspiration from temple prayer. We have old water well at North-East corner of the plot; which is auspicious for whole Temple project. We are trying to enhance the spiritual importance of this well with providing a beautiful pyramid shaped roof supported by artistically carved sand stone pillars. This pyramidal roof will generate and increase more energy in this well water. We may have to increase depth of the well if it is necessary. Design of Entrance Gate and compound is designed in such a way that, it will create spiritual atmosphere in and around the temple Vastu (structure) so that devotes will bow his head with respect while entering the temple. We are fully sure that the dream project of your trust will fulfill your wishes and all devotees and will get complete satisfaction of the life. All we pray together for good result and blessing of Mataji.